On October 4th, 2016 at 6:30 p.m., photographer Mike Smith comes to Fountaindale Public Library to share his knowledge and experience. Since 1985 Mike Smith has been creating stunning imagery through his photographic skills. Your pre-safari workshop will consist of instruction on how to achieve stunning wildlife images. You will learn tips and tricks—such as how to work with fences and glass that come between you and the animals—to improve your composition for shots taken in both the wild and zoo environments. You don’t have to be a pro to learn, anyone with an interest in photography will benefit from this informative workshop. Registration is open for this event. Sign-up today! Capturing a live event on video is a lot of fun, but it can be a bit challenging, too. Graduations, school plays, and kids concerts, are just a few events you might consider capturing. All you need is a video camera, a tripod, and a bit of planning. Studio 300 can provide the equipment and give you some pointers to make sure you get great results. Keep an eye out for upcoming programs at Studio 300 about event videography. Meanwhile, here’s a short event video about this year’s Winterfest. 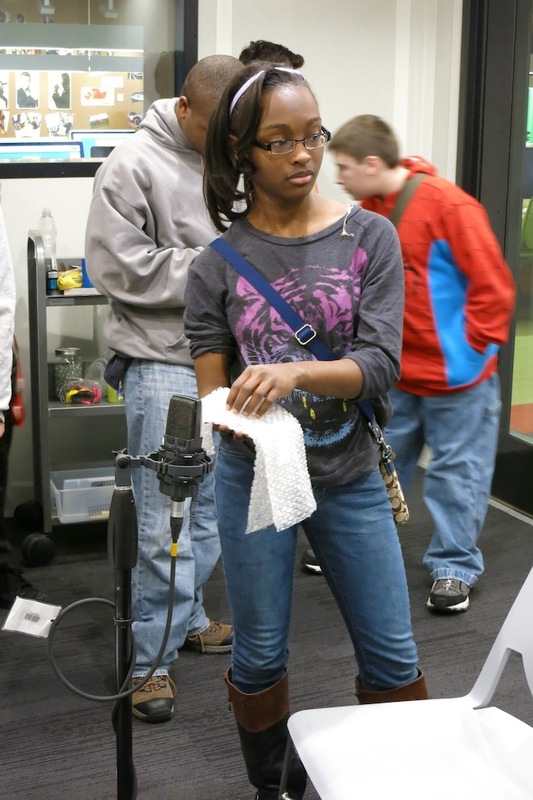 In January the monthly Teen Media Club took on the task of learning the sound art of Foley. Using a short clip from the Pixar animated film, Wall-e, the teens gathered together odds and ends to recreate sounds to accompany the film. While watching the film clip, they manipulated objects to bring sonic life to what they were watching on the screen. In one segment, a piece of bubble wrap and some gentle tapping and scraping with fingers simulated the walk of a cockroach. In another sequence, a cup, finger cymbal, plastic decoration, basketball, and other items became the sounds for a variety of items thrown by the title character into a lunch bucket. 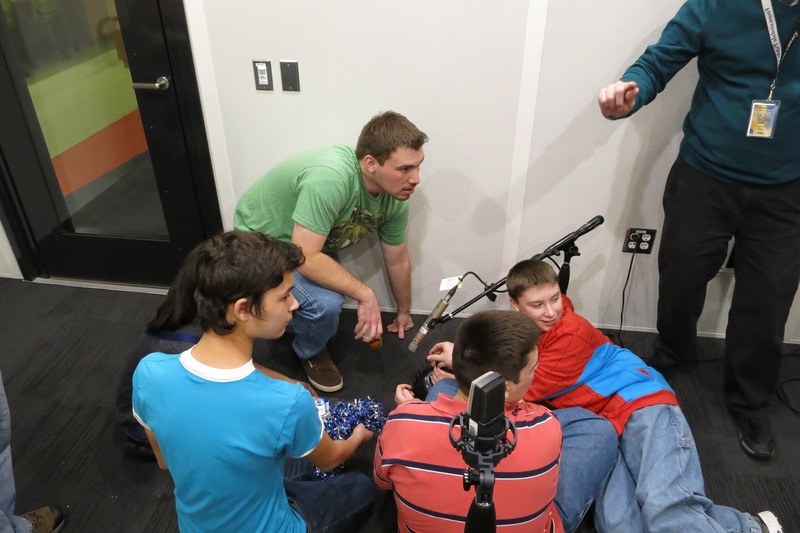 Listen to some of the sounds made and recorded by the teens in Studio 300’s Audio suite L below. Make a commitment in 2014 to learn new digital media creation and storytelling tools. Studio 300 can help. We have books, classes, and staff to assist. You also might consider using Lynda.com (watch the Lynda.com story here). This unique training website teaches the latest software, creative, and business skills through high-quality online instructional videos featuring recognized industry experts. Learn 23 advanced Logic Pro music mixing techniques as two engineers perform actual audio adjustments inside Logic. This includes files you can download and use inside Logic for hands-on learning. Shows you how to stay up to date with the latest educational technology and classroom management techniques. Studio 300 has 18 27-inch iMac computers eight of which have dual monitors. Macs may seem like the opposite of PCs but there are only minor differences between Macs and PCs. Let’s compare Mac OS X which is what we have in Studio 300 with computers running Windows. Although PCs can mean any personal computer, in this instance we’re going to be using the term PC to mean Windows. There is no way of really knowing how many people are using Windows operating system over a Macs due to the availability of running Windows on a Mac computer and the growing popularity in Hackintosh which lets you download Mac software on your PC. That said the sales of Windows is still way above the sales of Macs at 78% according to data from Asymco making security attacks and viruses more prone on a PC. If you play online video games, you’ll know that on Steam there are a lot more games for PC (at over 1,300 games) while there are only about 200 for a Mac. The most obvious difference between a Mac and a PC is the price. Where most Mac computers are over $1,000 you can get a PC for under that much. The reasoning behind the price for Macs are due to the high gross profit margin, the quality in parts, and that everything is custom made making for a more effective customer support system. When a problem does arise, only having to go to one Genius Bar and getting face-to-face assistance as opposed to possibly calling multiple oversees companies just to figure out the underlying problem is a big reason for customer satisfaction. But there are smaller differences that can also enhance your experience. On Macs there is a dock that holds your favorite apps. If you minimize a screen, it goes to the dock and if there are other apps open, a small light is displayed underneath that app on the dock. You can decide how many and what app icons go on your dock and you can have it disappear for a larger viewing experience. The keyboard is a little different on a Mac too. The most common keyboard shortcuts on a PC use Ctrl plus another key but on a Mac the command key is used instead of the control key. The PrintScrn key is non-existent on a Mac keyboard. That shortcut is shift+command+4 which then changes the cursor to a cross-hair. You can then click and drag anywhere on the screen to take a screen shot. 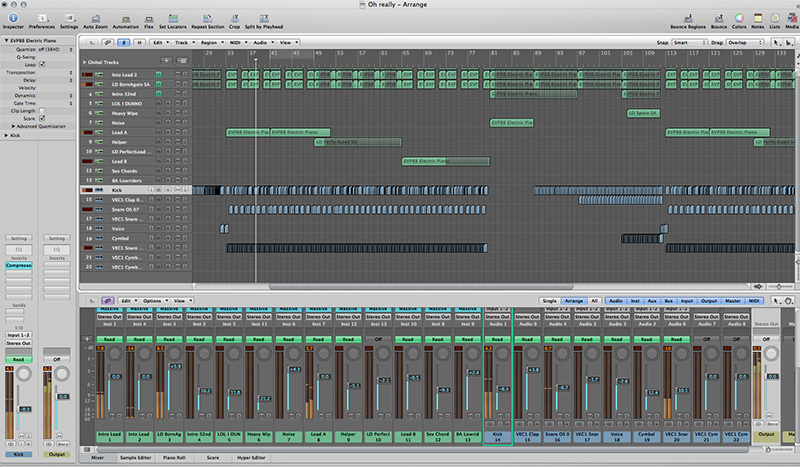 There are other keyboard and folder navigating differences that we can show you in Studio 300. The software iMovie, Garageband, iPhoto and Photobooth are other great aspects of the iMacs in Studio 300 that you may not necessarily find on a PC . If you’re interested in learning more about how to use a Mac or any of the software listed above, sign up for a class in Studio 300. After a few weeks of instruction, several Fountaindale Public Library patrons completed their initial training on the Native American Flute. During their last session, they performed several pieces. Studio 300 was there to help record these performances for the students to keep and share. Below is an excerpt of just some of the music played that evening. Native American flute performances recorded with Studio 300. Interested in learning how to record audio and music in Studio 300? Take one of our popular programs or stop in to schedule a one-on-one training session. Maybe we can feature your work in a future blog post.